Rebecca Kling returns to the Chicago Fringe Festival. This Saturday I made the trek down to Pilson to catch a trio of shows on the final weekend of the second annual Chicago Fringe Festival. To add to my initial impressions from last year, I’ll simply say this: Chicago’s Fringe Festival continues to amaze and inspire me. From the awesome and up-beat volunteers who did everything from stage management to ticket taking to directing people to the various venues, to the large and enthusiastic crowds at each show, I left feeling great about Chicago and its remarkably supportive theatre scene. And, as is to be expected with a festival where the works are chosen purely by lottery, the quality of the pieces can be more than hit-or-miss. Overall, I fared ok in my choices — one of which (Let Me Count) was a completely random choice as the show I intended to see (Barely Balanced: Acrobatic Daredevils) was sold out. 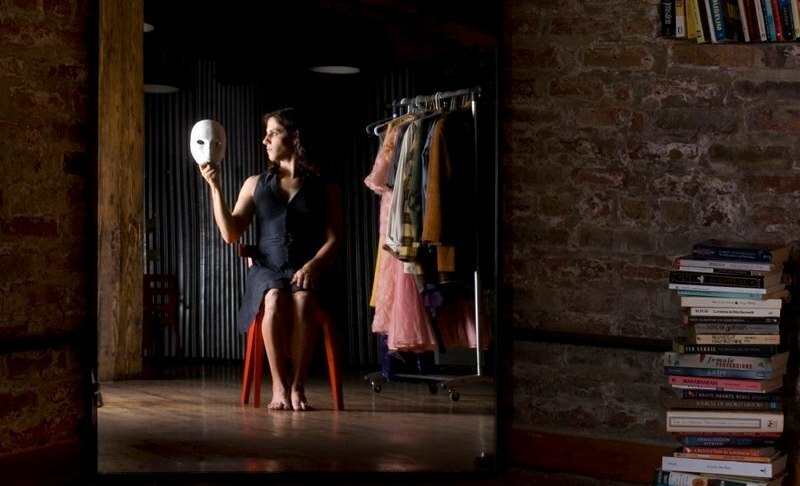 Rebecca Kling‘s one-woman show begins before it starts. As we enter the cozy space, she stands in front, greeting people as they take their seats and quizzing them on transgendered triva (correct answers got a goodie bag donated by a local adult toy store). Kling, a dynamic, confident and sincere performer who makes a return engagement to the festival, uses this opportunity to help edify her audiences about not only what it means to be a transgendered person, but how we all should start challenging the way we even think about gender in general. The driver for this piece, on senses, was the recent firing of Kling as a theatre instructor for a high school group, as the principal for the school felt Kling’s presence would bring about “uncomfortable conversations.” For Kling, this sobering outrage was the first time she’d experienced such blatant bigotry as a result of her gender identity, and it makes her, and us, question the way we think about gender in society. To augment her message, Kling turns to hilariously horrifying vintage film clips to demonstrate how deeply rooted our society’s obsession with clearly defined identity models (girls like Barbie and should be shameful of their periods, boys play contact sports and should avoid, at all costs, the sick homo down the street). She also uses a recent study by the National Gay and Lesbian Task Force on transgendered issues to help illuminate her points — including the sobering reality that a staggering 41 percent of transgendered individuals have admitted to attempting suicide. I deeply admire Kling for her efforts, and her show is both entertaining and enlightening. When you take your seat at Kate Healy‘s solidly constructed, if somewhat static, solo show, the first thing you notice is a dusty trunk, center stage. “How awesome would it be if she popped out of there,” said my friend before the show. And wouldn’t you know it, at the top of the show, out of the trunk emerges the 6’3″ Healy, who’d been crammed in there for at least 15 minutes as we took our seats. Now *that’s* dedication. From this surprising entrance, Healy’s show inventories the details of her life, from embarrassing to illuminating to hilarious. For example, how many times have you walked by a homeless man and ignored him, or how many people do you think actually think about you every day? When you quantify your life’s output and experiences, it makes you ponder. It’s an interesting concept, but I found my mind wandering 20 minutes in. It also doesn’t help that Healy talks way too fast, and a lot of her lines got gobbled up in the echoey Doppler gallery venue. However, Healy has a lot of energy and a clear point-of-view, and I look forward to seeing more of her. The basic issue with Tim J. MacMillan‘s play is he tries to cram too much into the Fringe’s 60-minute running time. Too many characters and plot points compete with each other, and the well-meaning cast works overtime to make it all work. I won’t even try to explain the plot, because I’m not sure I understood it, but it has something to do with soul mates, guardian angels and huffing nitrous gas. Maybe in the play’s original 90 minute running time it makes more sense, but in this hour-long fringe format, I just couldn’t connect. That said, MacMillan certainly has a gift for creative thinking, as evidenced by his highly original fundraising campaign for the show. I hope he returns next year with a more realized and manageable one-act.